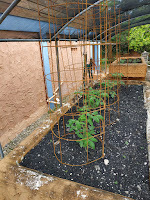 I wanted to make some tomato cages. Thanks to Pinterest (https://www.pinterest.com/), I came up with the perfect solution. 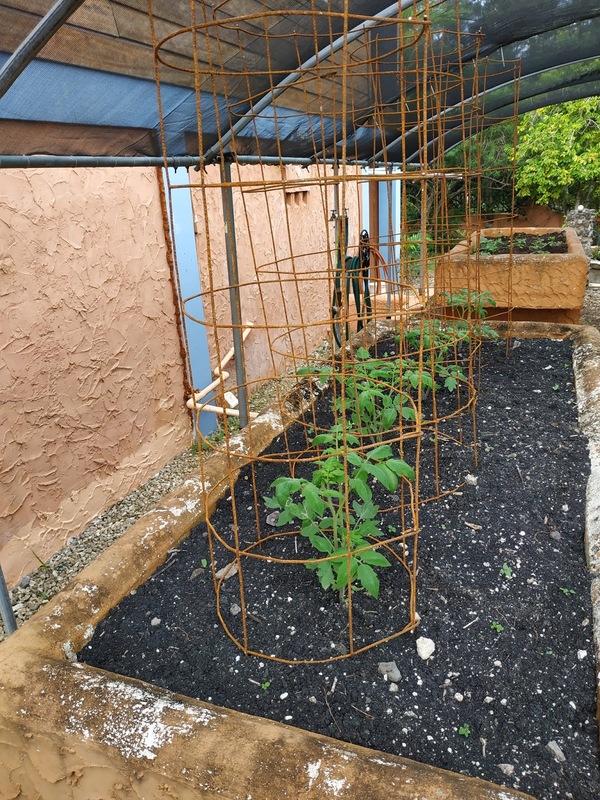 When I typed in 'tomato cages' in Pinterest, one of the first photos that came up was a whole role of 'matting', as used for concrete pads, walkways, etc. I thought that's perfect. Now all I had to do was find some matting. 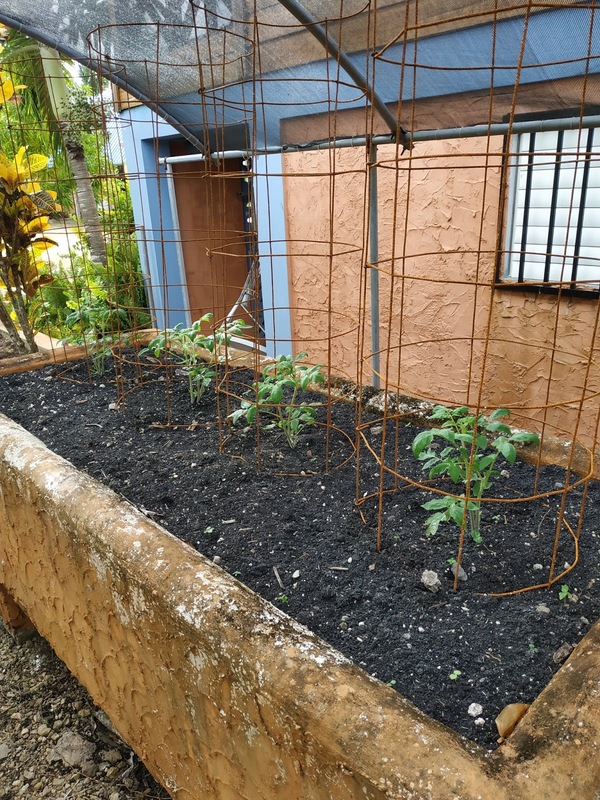 I texted Mario Zettina, the same contractor who rehabbed our pool, and the parking palapa, to see if, by chance, he had some extra matting just laying around. By a happy chance, he did. A couple of days later, Endher, his foreman, swung by and dropped off a partial role for me. Today was the day I decided to take a whack at making them. I figured they would need to be roughly three-feet high, and about twelve inches or so in diameter. Oh, I could have used the old standby formula, 2𝝅r. I skipped that, and went directly to the intertubes for it to work the formula and give me the answer. The answer was about forty-three inches +/- a smidge. The full roll was six-feet wide, so I cut the roll into two roles then laid out flat one role and cut that into 43-inch sections. Roughly 36"H x 43" Circum. Putting the sections together by crimping a bit of the wire to its opposite end of the section, I was able to come up with a round cage just the right height and diameter to work as a tomato cage. After making four of them, I was covered in sweat and was pooped. So, I figured the rest could wait till Monday when Carlos was here and he would be able to help me make the rest. 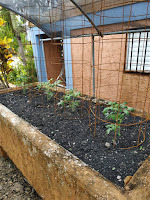 I should end up with eight to ten tomato cages. We'll be able to use a couple of them for the cucumbers as well. Of course, no job can be done here without adequate supervision. You can see Miss Noel checking the quality of the work. 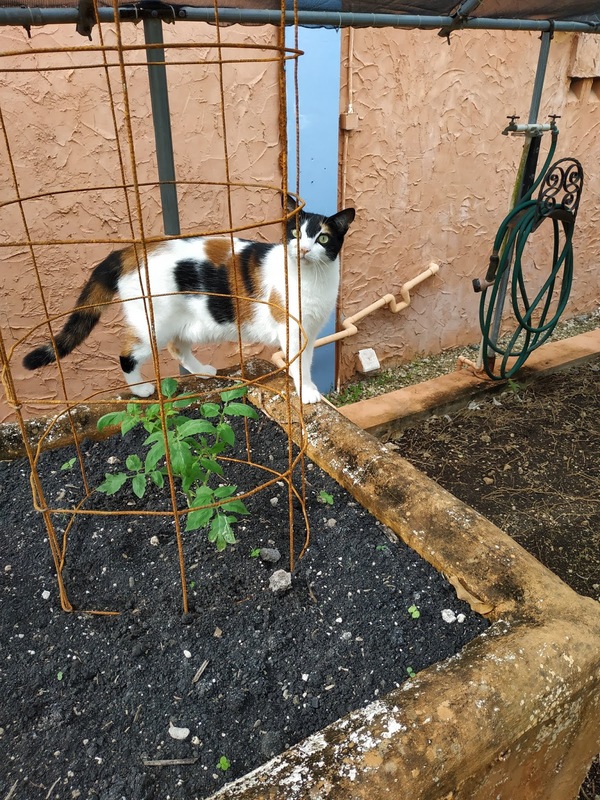 She likes to ensure that standards are maintained throughout her domain. We have four cucumber vines that have taken off like rockets in this bed. 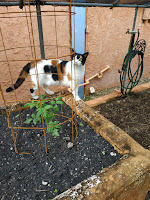 I was going to use a couple of cages here, but I'm afraid the cukes have progressed too fast to be able to use them. 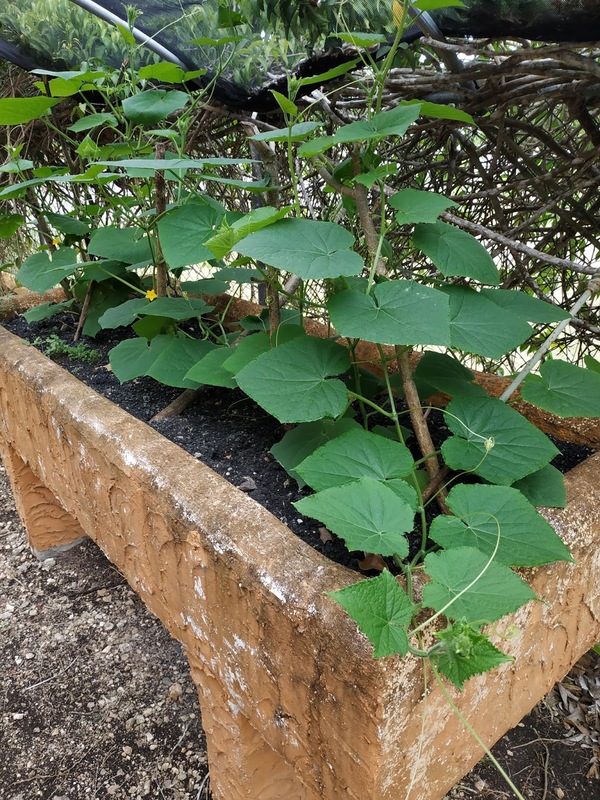 I'd like to see some zucchini growing as well. Since we've been on the Keto diet, we use zucchini for all sorts of things, like spaghetti noodles, ravioli wrappers, chopped up in salads, and for a host of other things as well. 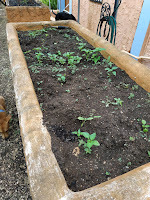 The slowest starting of the stuff we've planted is the sweet (or green) peppers. 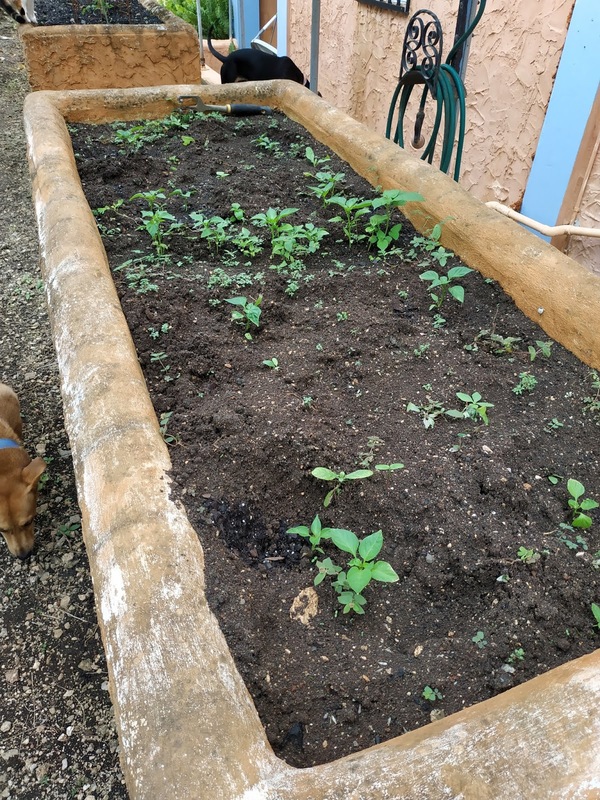 Carlos swears that there are four pepper plants growing in this bed.